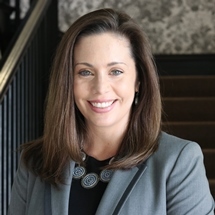 AMHERST, N.Y. – Amanda Gross, assistant athletic director for administration/chief of staff at the University at Buffalo, has been appointed chief of staff to the president of Daemen College. The appointment, effective Sept. 24, was announced by Daemen President Gary Olson. In this position, Gross will serve as advisor to the president and as liaison between the president and key internal and external groups and the Daemen Board of Trustees. She will also be responsible for oversight of the president’s office. Gross has held her current leadership position in UB athletics since 2016, having previously served as assistant athletic director for administration and assistant to the athletic director. Prior to joining UB, she was assistant director of development for major gifts at the University of Mississippi, and held fundraising positions in athletics at Duke University. Gross earned a master’s degree in sport administration from the University of Miami and a bachelor’s degree from Colby College. A native of Tampa, Fla., she resides in East Amherst.